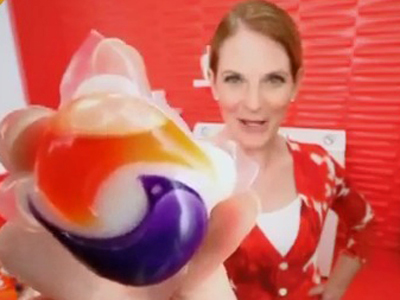 A month after the Centers for Disease Control issued a report showing that nearly 500 kids had been exposed to the lovely cleansing chemicals by playing with or chewing on colorful, shiny detergent pods, the folks at the Consumer Product Safety Commission have issued a safety alert declaring them harmful to children. “Liquid laundry packets are attractive to children as play items because they are soft and colorful and they resemble familiar items like candy, toys and teething products,” reads the alert. Of the hundreds of pod-related incidents reported to CPSC this year, there have been cases of hospitalization due loss of consciousness, excessive vomiting, drowsiness, throat swelling, and difficulty breathing. 1. Do NOT let children handle laundry packets. 3. If swallowed or exposed to the eye, immediately call Poison Help at 1-800-222-1222. Procter & Gamble, makers of Tide and just about everything else in your laundry room or under your sink, has already redesigned the container for its tri-colored Tide pods to make it more difficult for children to open. Senator Chuck “Charles” Schumer of New York has also been calling for manufacturers to rethink the design and packaging of these yummy looking pods. Tide Detergent Pod Containers Make Easy Trick-Or-Treat Baskets, But Is It A Good Idea?